Don't spend a long time making a thick and cheesy black bean soup. Make this fast and fantastic version in 10 minutes instead! 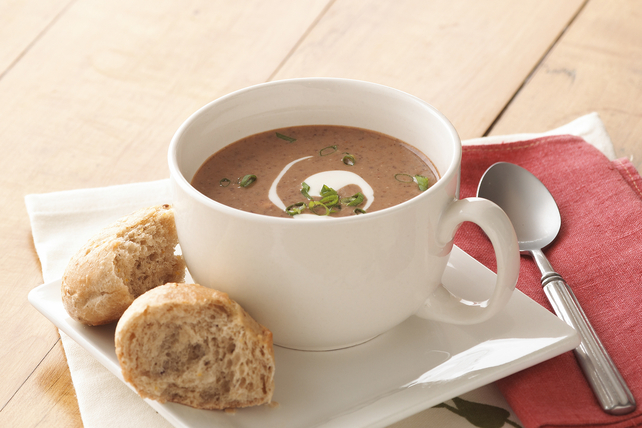 Warm and delicious, this Fast Black Bean Soup is perfect for warming up chilly days. Blend all ingredients except VELVEETA in blender until smooth. Pour into medium saucepan; cook on medium heat 5 min. or until heated through, stirring occasionally. Add VELVEETA; cook 1 min. or until melted, stirring constantly. Substitute 2 chopped KRAFT Singles or KRAFT 2% Milk Singles for the cubed VELVEETA. Garnish each serving with a dollop of BREAKSTONE'S or KNUDSEN Sour Cream, and a light sprinkling of chopped green onions.